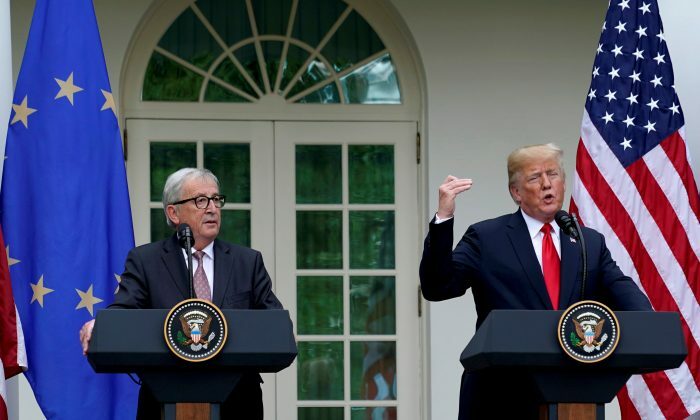 As the U.S.–China trade war heats up, U.S. President Donald Trump and European Commission President Jean-Claude Juncker have met in Washington and signed a trade agreement on July 25 that could further tip the balance to Beijing’s disadvantage. Per the deal, the United States will suspend further tariffs on the EU, including a proposed 25 percent tariff on European auto parts, while the EU will buy more American soybeans and energy in return. A day after the deal, White House economic adviser Larry Kudlow confirmed the joint effort to counteract China, according to a separate Reuters report. U.S. Trade Representative Robert Lighthizer said on July 27 that he and Japanese economy minister Toshimitsu Motegi would discuss a free-trade agreement in the next 30 days, according to the Japan Times. A little over a week earlier, on July 17, the Japan Times reported that Japan and the EU had signed an economic partnership agreement, creating a free trade zone that would account about for 37 percent of global trade. On July 12, prior to the most recent trade deal between Japan, the EU, and the United States, prominent Chinese economist He Qinglian spoke with the Chinese-language edition of The Epoch Times about the present state of global trade, which Trump is working to restructure. In He’s analysis, China has been the biggest beneficiary of the present global economic system, since the communist regime’s repeated violations of WTO regulations have gone unpunished. She also said that Chinese companies have been able to compete against their U.S. counterparts by stealing intellectual property. China has not genuinely opened up its market as it promised 17 years ago when joining the WTO, said Xia Yeliang, former professor of economics at Peking University, in an interview with RFA. To illustrate his point, Xia said that China’s requests to be granted the status of “market economy” had been repeatedly turned down because of the communist regime’s excessive interventionism. It is difficult for the United States to coax China into further reforms under the current WTO framework, Xia said, but creating a new trade mechanism could change this. Zheng Yongnian, a professor of the East Asian Institute at the National University of Singapore, gave an interview with the regime mouthpiece People’s Daily, saying that the recent developments in global trade were not unexpected. His comments appeared in an article posted on the media’s WeChat page. Zheng said that China never was a match for the United States, since China still lags far behind in terms of military, GDP, and technological development. For China to invite foreign investment and become competitive, it has no choice but to carry out reforms—for example, by protecting intellectual property rights. Leveraging their massive combined market, Wang said, the United States, EU, and Japan could effectively become the board of directors in a reordered world economy.